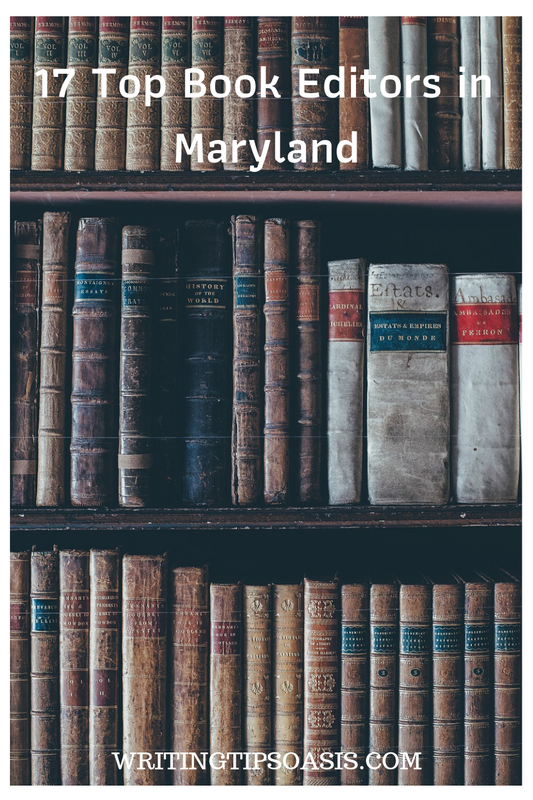 If you’re an author based in the Mid-Atlantic region of the United States and are looking for opportunities to submit your book to publishing houses, here are 16 top book publishing companies in Maryland. If you’re still at the editing stage though, and require an editor near you, take a look at the following 17 top book editors in Maryland. Note: Finding a good editor takes time. Research some editors with expertise in editing the genre of your book, contact them to find out how they respond to you and to learn about their editing method, request sample edits, and ensure your completely happy before proceeding. As a freelance editor and founder of Revision Division, an editorial service based out of Baltimore, Maryland, Kimberly Hunt offers a wide range of book editing services like copyediting, developmental editing, and proofreading. She has previous experience working on a number of different projects, including fiction, nonfiction, and website content editing. Her rates for light copyediting begin at $0.015 per word, heavy copyediting at $0.025 per word, she offers developmental editing starting at $40 per hour, and she offers proofreading at a starting rate of $0.0125 per word. If you’re interested in working with Kimberly, the best way to reach her is either via email or through her website’s online contact form. Be sure to mention the type of book you’ve written, it’s approximate word count, and the type of editing service that you’re interested in. Sabrina Leroe is an award-winning editor of academic and nonfiction writing. As the founder of Bespoke Editorial, Sabrina has extensive experience working on projects of self-help, popular science, memoirs, biographies, technical guides, and books about philosophy and psychology. Based out of Silver Spring, Maryland, Sabrina offers developmental editing, line editing, copyediting, and proofreading services. Her line editing rates start at $0.035 per word, copyediting at $0.02 per word, and proofreading begins at a rate of $0.015 per word. For her developmental editing service, it’s best to contact her directly to receive a free and accurate quote. She’s more than happy to provide a free sample edit of the first 500-750 words to give you a better sense of her editing capabilities. If you’re interested in working with Sabrina, you can reach her either via email or through her website’s online contact form. Allisson Erin Wright is a full-time freelance editor who specializes in working on fiction projects. Based out of Fort Washington, Maryland, she has worked with authors like Bianca Blythe, Harmon Cooper, and Cordelia Castel. Services that she offers includes developmental editing, manuscript evaluations, outline critiques, blurb critiques, and copyediting. For a better sense of her service rates, you can find more information here. Allison offers free sample edits of the first 1,000 words of your manuscript to provide a better sense of her editing style. She loves to work on a wide variety of fiction genres, including fantasy, science fiction, romance, horror, young adult, and children’s fiction. If you’re interested in working with Allison, you can reach out to her to book her services through her website’s online contact form or via email. Rebecca Coleman is a freelance editor and the founder of Five Points Editorial Services. She has prior experience working as a bestselling novelist with several major publishing houses, and has since gone on to become a very talented and thorough book editor. She prefers to work on projects of “book club” fiction, and she also happens to have a specific interest video game-related nonfiction projects. Services that she offers includes line editing, copyediting, proofreading, and fact-checking. Her line editing service starts at $36 per 1000 words, her copyediting starts at a rate of $22 per 1000 words, and her proofreading and fact-checking services start at $48 per hour. For a more accurate project quote, it’s a good idea to reach out to Rebecca for more information. If you’re interested in her services, you can use her website’s online contact form or reach Rebecca via email. Based out of Laurel, Maryland, Melinda Campbell is a freelance editor and founder of MCEdits. She is an editor who especially loves to help female authors hoping to make it through the publishing industry. She’s capable of editing both fiction and nonfiction projects, including genres like romance, fantasy, science fiction, paranormal, and books about dogs, food, and drinks. Services that she offers includes proofreading (starting at $75 per 10k words), and crucial copyediting (at a rate of $125 per 10k words). She also offers a wide variety of coaching options, which can be found here. If you’re interested in working with Melinda, you can contact her either via email or through her website’s online contact form. Patricia J Bower is a freelance book editor and founder of Diligent Editorial and Book Production Service, which is based out of Odenton, Maryland. With over seventeen years of experience in the publishing industry, Patricia used to work as an inhouse editor at a major publishing company. With a BA in English, Patricia likes to work with both traditional and independent authors. Services that she offers includes manuscript formatting, notes, in-text citations, and reference listing, copyediting, and proofreading. Since all manuscripts vary in genre, length, and quality, Patricia recommends that you reach out to her for a free project quote. You can do so by using her website’s online contact form or via email. Christina M. Frey is a freelance editor and founder of Page Two Editorial, based out of Crofton, Maryland. She has over ten years of experience working in the publishing industry, eight of which she’s spent as a book editor. She has worked with a number of bestselling authors, and is always on the lookout for new talent in need of a bit of editing guidance. She hopes to work on fiction manuscripts in a wide variety of genres including speculative fiction, science fiction, fantasy, young adult, new adult, women’s fiction, literary fiction, and memoirs. Services that Christina offers includes developmental editing, substantive editing, line editing, copyediting, and coaching. You can contact Christina via email in order to ask for more information, or to request a free project quote. Be sure to include a bit of information about your project, including its approximate word length, the type of editing you’re looking for, and its genre. With over forty years of experience in the publishing industry, Elizabeth Koozmin is a freelance editor and founder of Catoctin Editorial Services. She is based out of Frederick, Maryland, and has earned a BS in Geology and MS in Geographic and Cartographic Sciences. She specializes in editing nonfiction projects, and prefers to work on titles of an academic nature. Services that she offers includes developmental editing, copyediting, and proofreading, as well as writing services for blog, manuals, pamphlets, and fact sheets. She’s also capable of providing consultation services to help you determine where and if your project needs development in certain areas. You can view Elizabeth’s detailed editorial resume here. If you’re interested in working with her, you can contact her via email to request a free project quote. Barbie Halaby is a freelance editor who specializes in historical fiction, women’s fiction, and Christian fiction. Based out of Pasadena, Maryland, Barbie has over sixteen years of experience in the publishing industry. She has worked on projects like “Chop, Chop” by L.N. Cronk, “When Eternities Met” by Matt Rohde, and “Clarissa Jean, Homecoming Queen” by Jessica Goodwin. She is also the founder and operator of Monocle Editing. Services that she offers includes manuscript evaluation and critique, line editing, copyediting, and proofreading. She notes that since all projects vary in genre, length, and editing needs, she strongly encourages you to reach out to request a free project quote. The best way to reach Barbie is either through her website’s online contact form or via email. Based out of Baltimore, Maryland, Cleis Abeni is a freelance editor with over thirty years of experience in the publishing field. Cleis holds an MA in Writing from Johns Hopkins University, and has worked on a number of nonfiction projects like “The Ways That Police Deal with People” by Mengyan Dai and “Image of the Singing Air” by Eva Magdalene Gholson. Cleis offer a wide range of editing services, including fact-checking and research, marketing, copyediting, indexing, substantive editing, and more. The best way to reach out to Cleis is via email to request a free project quote, or to ask for more information. As the founder and operator of Castle Walls Editing, LLC, which is based out of Solomons, Maryland, James Michael Gallagher is an experience freelance editor with more than twenty years of experience. He specializes in working with projects of horror and general genre fiction, but is happy to expand into the realms of nonfiction to meet his client’s editing needs. Services that he offers includes proofreading, copyediting, line editing, and ghostwriting to assist in book-jacket copy, nonfiction work, and even project outlines. He is unable to post his rates on his website due to the fact that all projects require different levels of attention. The best way to receive a free project quote is to contact James via email or through his website’s online contact form. Rawles Lumumba is a freelance editor and writer, as well as the founder of Lucidity Editorial. She loves to work on projects of fiction, especially romance, fantasy, science fiction, and young adult fiction. She’s very interested in working with projects that feature characters often marginalized in fiction, and loves to edit manuscripts that deal with the issues of race, gender, sexuality, and their overall intersectionality. Services that she offers includes readers reports (starting at a rate of $450 for a manuscript of 75k words), sensitivity reading (at a rate of $250 for a complete manuscript of 75k words), sensitivity consultations at a flat rate of $100, substantive editing (at a starting rate of $1500 for a manuscript of 75k words), line editing (rates vary), copyediting (at a rate of $450 for a standard manuscript of 75k), and proofreading (at a rate of $250 for 75k words). She is also happy to provide a sample edit of the first fifty pages of your manuscript for a flat rate of $75. If you’re interested in working with Rawles, you can reach out to her via email or through her website’s online contact form to request a free quote. Services that she offers includes proofreading ($0.018 per word), copyediting (at a rate of $0.029 per word), developmental editing (at $0.064 per word), and manuscript evaluations (starting at a rate of $3.75 per page). She is happy to offer a free thirty-minute consultation to help determine a fair and accurate project quote, as well as provide a free sample edit. If you’re interested in working with Katherine, you can reach her via email. Judith C. Reveal is a freelance book editor and founder of Just Creative Writing and Indexing Services, which is based out of Greensboro, Maryland. With nearly twenty years of experience in the publishing field, ten of which she has spent as a freelancer, Judith has worked on projects like the Kent County Heritage Guide, the Georgetown Yacht Basin Monthly Newsletter, and was the editor of Key Words with the American Society of Indexers. Services that she offers includes manuscript reviews, line editing, content editing, manuscript organization and formatting, and fact-checking. Her rates begin at $35 an hour, and a flat rate of $125 for a manuscript report. She estimates that she can get through approximately ten pages of a manuscript in one hour. For more information, or if you’re interested in working with Judith, you can contact her via email or through her website’s online contact form. Based out of Annapolis, Maryland, Leah Weiss is a freelance editor and writer with almost thirty years of experience. She has worked on a multitude of different projects, including editing novels, magazine articles, journal articles, academic papers, grant proposals, video scripts, resumes, and more. She has worked with authors like Matt McConville, Tema Encarnación, and Dr. Molly Mee. Services that she offers includes proofreading, copyediting, developmental editing, and ghostwriting. She charges by the hour in accordance to the rates set by the Editorial Freelancers Association, but she strongly encourages you to reach out to her for a more accurate project quote. You can do so by using her website’s online contact form or via email. Laura LaCapelle is a Maryland-based freelance editor and founder of Salty Wave Books, a book editing and proofreading service geared toward independent self-publishing authors. Laura has over twenty years of experience in the field of communications, which includes publishing, marketing, advertising, and public relations. She likes to work with all types of fiction and nonfiction genres, but unfortunately does not accept cookbooks, highly technical nonfiction projects, poetry collections, or short stories. Some of the services that she offers includes developmental editing (at a rate of $0.06 per word), line editing (at a starting rate of $0.04 per word), and proofreading (starting at just $0.025 per word). For more information, you can review her editing services and rates here. If you’re interested in working with Laura, the best way to reach her is through her website’s online contact form. Gina Hagler is a freelance editor and founder of The Savvy Writer, a writing blog whose sole purpose is to help support author independent authors out there looking to make it in the industry. Based out of Rockville, Maryland, Gina offers manuscript formatting, book reviews, ghostwriting, research, and general manuscript editing. With over fifteen years of freelance experience, Gina knows exactly what it takes to make an average manuscript turn into a fantastic one! For more information, or if you’re interested in working with Gina, you can contact her via email. You can also find her comprehensive freelance editing and writing resume here. Have you worked with any other book editors in Maryland? Please tell us about your experiences below!